May 7, 2015 12:13 am. A quinella is a popular bet type where punters must select the first two horses in any order, but they also have the choice to select which order the horses will finish in. They are one of the most common bet type among punters due to the rewarding payouts. Quinella payouts all depend on how big the quinella pool is, but even if the two favourites finish first and second, the payouts are still profitable. A Boxed Quinella allows punters to pick as many horses as possible for both first and second places. Your selections must must place first or second in any order for the bet to be successful. The more runners you select for your boxed quinella, the more combinations will you have, but the cost of the bet will increase. A two-horse quinella costs $1 for a 100 per cent return of the quinella payout. A three-horse quinella for $1 will cost $3 — $1 for every runner. If you were to select five runners in your boxed quinella, this would cost $10 for a $1 unit. This is simply selecting two runners only in your selections. Both runners must either finish first or second in any order. Punters can bet any amount on this option — a $5 quinella will give you five times the quinella payout. A Standout or Banker Quinella is where a punter can choose as many runners as they want, but they must select one of these runners to either finish first or second in the nominated selection. The best part of taking a Standout Quinella is you only pay the price for your ‘other’ runners, and not the one you have banked. To finish second: (1) Decircles, (7) The Bowler, (10) Tanby. This 1/3 selection costs only $3 for a $1 unit. As with other betting options, there is an Easybet option for quinella players. Bettors need to input the amount they wish to spend and the computer will do the rest and make your selections for you. There are many different combinations available for quinella bettors but the most common problem is that they don’t know what they cost. Here is the table for runners 2 through to 24. The maximum amount of runners you can select in Australia is 24 as that is the limit of horses allowed in each race. Boxing 24 runners in the Melbourne Cup would cost a total of $276 for a $1 unit, which may seem expensive, but the 2013 quinella paid $169.10 even though the favourite Fiorente won. In 2012 the quinella paid a whopping $506.90 when Green Moon won paying $22.50 and Fiorente finished second at a place price of $11.80. A few years earlier in in 2008, the quinella paid $533.20 when Viewed won paying $46.50 and Bauer paid $6.50 for the place. These examples show that it can pay off in the big races, but only box a large amount of runners when the pools are very high. In a small midweek race, the pool won’t be very big so the risk won’t be worth the reward. Online bookmakers have made it very easy to place a quinella bet. Find your desired race, click into “Quinella” in the exotics section and tick the runners you wish to include in your quinella. 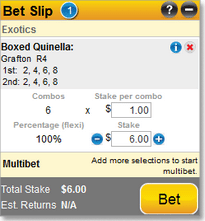 If you’re looking for a boxed quinella, simply tick all horses under the “Boxed” section. If you wish to have a Standout or Banker Quinella, then place the horses in either the “1st” or “2nd” box. Once you have selected your runners, a bet box will appear and put in the amount you wish to spend. The percentage return will also appear for those playing multiple runners and all the information will appear on your bet slip.